Requires a massive quantity of sprite updates and collision checks happening every frame. Very large bullet pools with constant object recycling, 8-way movement and firing and all of this supported across two players. Also features large end of level bosses comprised of several sprite segments animating in unison. For us the take-away from Smash TV was the need for careful optimisation of our internal groups, and a means to handle collision on a rapid basis often using very small bounds. This bitmap based Asteroids style game would require pre-baked sprite rotation support. Shooting at any angle, inertia, thrusting and velocity. Also everything can wrap at the edge of the camera smoothly. Collision detection is precise and not based on bounding boxes. Very large scrolling tile map and large quantity of baddies coming from spawn points. These requirements were new, but the 8-way movement and firing, multi player support and large quantity of on-screen baddies was the same as Smash TV. The weapons also have limited ranges (usually just to the screen bounds). 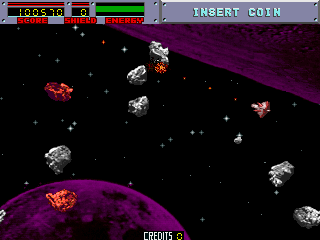 This classic shoot-em-up features a large vertically scrolling tile map. So we can use a similar system to the tile map required for Gauntlet, except it has multiple parallax layers to it. More importantly the sprites can ‘dive’ between the layers, swapping collision group as they do so. Again there are a large number of sprites visible and a large bullet pool – with lots of alien paths, building on that needed for Galaxians. A simple starfield effect in the background could lend itself well to an optional FX plugin for the framework and it also features an in-game shop and power-up system. While these are not directly framework specific they do open-up the can of worms that is in-game UI and controls. More tile map action, this time horizontally scrolling. Only you can jump between different layers of the tile map, meaning we need to support one-way collision tiles. The player fights based on key combinations which are often context sensitive (i.e. if you’re close to an enemy you can hit instead of throw a star). The player animation is broken down into parts – legs, body, arms, all linked together in unison. Finally baddies can traverse the map, jumping gaps and jumping down to get you – which lead us to question if a basic AI system ought to be considered from the start. 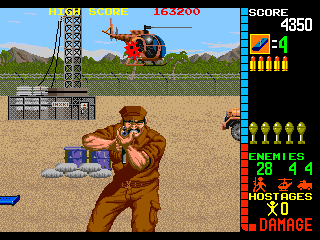 A large scrolling playfield with coordinate and timer triggered events (baddies attacking, helicopters flying on, etc). This sequencing of events became a huge re-occurring requirement the more games we explored. The game is a simple shooter – just point and click. But it has a lot of overlapping sprites, and you only want the sprite at the front to receive the collision, so we’ll need to make sure our collision system can respect sprite depth – and also make sure our sprites can be depth sorted for rendering. This is a button mashing sports game. It needs precise timed key events, but they are against the game timer, not a ‘real world’ timer. Also the animation speed of the sprites are based entirely on the speed of your key presses, which means our animation playback needs a frame advance feature (or the ability to dynamically set the fps rate). The scrolling speed also requires the same. Requires top-down collision detection with irregular shaped track objects. There is car propulsion, driving, skidding, cornering and handling to consider for our motion class. On some levels the track overlaps as well which means the track collision needs to change based on if you are under or above the road. This lead us to consider about swapping between collision layers and paths flowing between layers as well. These are single screen adventure games but set on a map. So the camera needs the ability to snap to a new ‘screen’ within the map but still position all baddies and items locally. The most interesting part of these games however are that you need the ability to reset parts of the map, for example to deal with destroyed tiles or moved items. The original map data must be able to be restored, either all of it or just a part of it. This lead us to consider the fact that our tilemap system should allow you to create a snapshot of the tilemap at any point within your game, and be able to revert back to a previous snapshot as needed. We envisaged having to deal with collision issues, for example if you restored a snapshot that caused the player to become buried in a tile that wasn’t there before, but we explored having options to let the developer deal with this such as ‘kill the object’, ‘move it’ or just return a list of all objects that are effected and let them deal with them on a case-by-case basis. Ignoring the text input and parser for a moment these games all require something we spotted again and again, the more we delved – and that was the sense of mapping game data on an almost room by room basis. In an adventure game you’re literally placed into a ‘room’, it can contain items, exits or other characters and retains its own state. Sometimes things dynamically change (i.e. exits appear based on the state of an object or something in your inventory) but essentially you’re looking at little data buckets for every location. As we studied more and more games we identified this requirement. 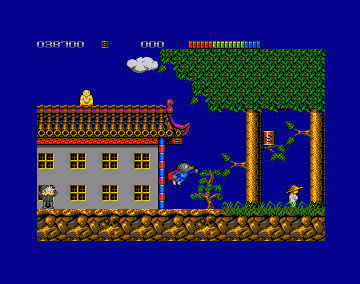 In the single-screen games above it was needed to maintain the state of items within each screen, in point-and-click adventure games it was needed in a graphical way. Even in trading games like Elite or tactical games like X-Com you could consider the resources of each planet or sector as ‘rooms’ and the objects within them. It was this that lead us to conclude that some form of game object management was a really high priority. It wasn’t just about the sprites and the particles, but the underlying data the game needed too. So we’re planned in classes to support this: room creation, item placement, inventory and states. Ignoring the 3D side of these games for a moment and you’re dealing with a large scale game world, with object placement within it (buildings, tanks) and the ability to move around in 3D space. This means path finding, movement and collision through 3 axis. Not a trivial requirement to add, but with WebGL firmly planned in the future not something we should ignore either. And we literally carried on like this with page after page of games, only a fraction of which are represented in part above. Don’t let the ‘retro’ nature of the games up there put you off – try not to look at them in their original state, but rather look at what they contain inside, what would supporting their mechanics open-up? As we progress with development we’re going to be actively checking-off games from our list and will even milestone points of the framework against them. Rather than just saying ‘the tilemap class is finished’ we’ll be asking ourselves ‘can we now make the map from Sonic?’ and similar. It’s important to point out that we’re not coding superfluous pieces into the framework just to cater to a subset of games we picked, but that we are identifying mechanics that are globally useful, and implementing those instead. It just seems to make a lot of sense to us to prioritise like this. Posted on July 20th 2012 at 2:54 pm by Rich. Nice to see this process going on Rich, sounds like you’ve got a lot of work on your hands. 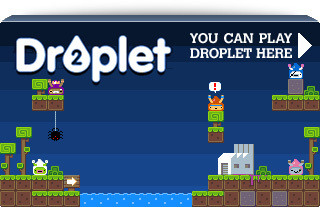 That said, I have total confidence that Kiwi.js is going to rock the world of HTML5 games. Keep up the wonderful work, and K.I.S.S. any release date for Kiwi.js? Ben – we’re going to be ‘building it live’ so to speak, but we want to get the core wrapped up first and documented. All the dry stuff, data structures, groups, transforms, camera, etc – once we’re at that point we’ll open the repo and work towards our first release. I expect this to be about a month away. Wow! 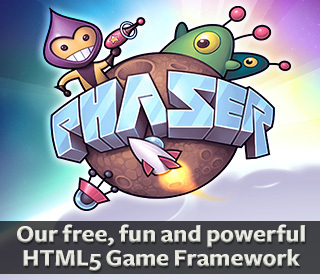 The framework sounds brilliant, Though I’m not giving up on Flash, this framework may just get me to take a look at HTML5 development, which I’m still not sold on, but that’s another topic. Will box2d play nice with the framework? Awesome work, guys! Have you analyzed turn-based games? Like Chess or maybe more complex things like X-COM. What impact does the turn management have on your update pass? I look forward for your comments on 3D games using WebGL!! Yes we’ve looked at Chess and X-Com and other turn-based games, and games with battle times, etc We’ve thought very hard about how time will be handled in-game. Still some thinking to go, but we’re making sure time can flow at any rate, and in any direction, in-game. Yeah sorry Shawn, that’s not on the cards yet. Yes we’re going to be working closely with TreSensa to ensure we can support networked games from the core. Congrats, Rich. Love the forward (backward? ha) thinking of planning this out. As far as tile map editing goes, are you considering doing a custom LUA exporter for DAME? We will be supporting DAME, yes. Probably not a custom export to start with, but we’ll definitely have it eventually. To start we’ll just make sure the CSV format it exports will work. I can’t wait for kiwi! Are you using flixel’s collision functions or your own? Hi. Looking forward to seeing this when it’s done. Is this a paid product, or is it going to be free? If it is a paid product, how much? We’re still developing like mad, currently sorting out documentation, logging and box2d integration. I can’t give a timescale for release, sorry, but everyone is working hard on it. With source material like that you guys can’t fail! Really looking forward to it. I’m currently working on a turn-based naval RPG I would like to try hooking into this! Happy to be a guinea pig for using/testing out some of the components of the framework, esp. Health/life bars, Server sockets, and general sprite layering. Next question is… Do you use Kiwi.js to develop your games internally now?